And the second prize goes to…Yayyyy! It’s me! 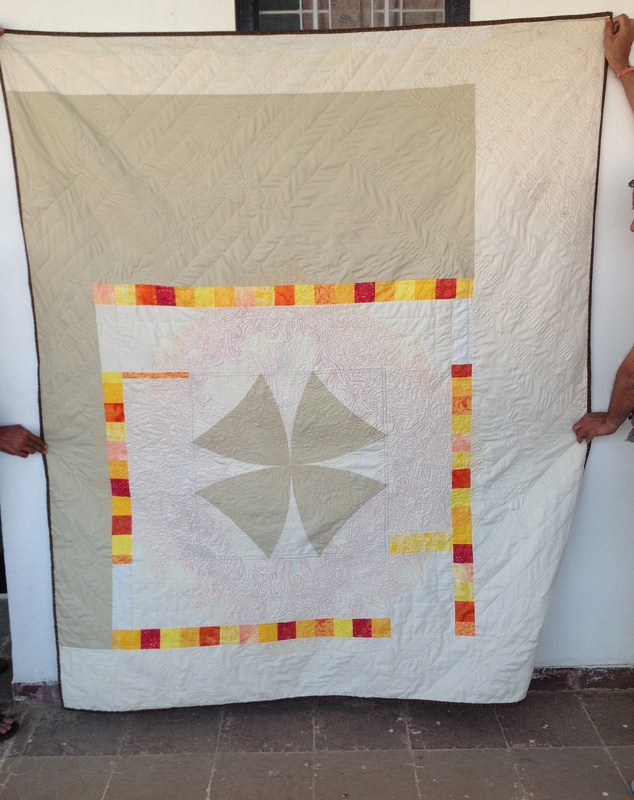 This Quilt Tells a Story (with an Indian twist!) 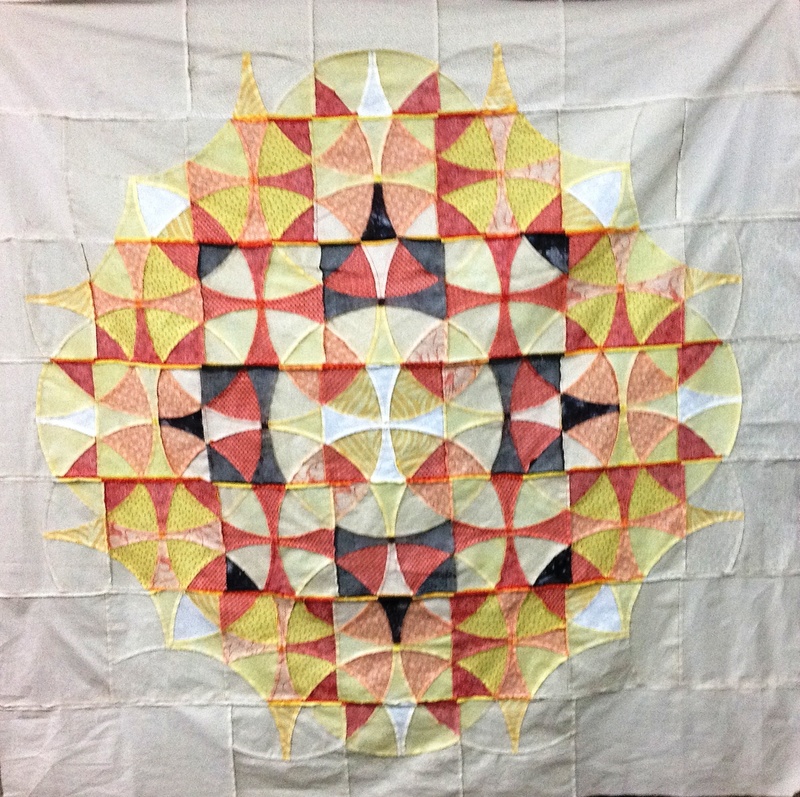 This is a wedding quilt, the pieced winding ways block representing the sacred fire around which the bridal couple circumambulate and take seven steps ( quilted footprints around the fire) before making their vows, during a Hindu wedding ceremony. Am so happy to share that I won the second prize in the Husqvarna Viking India Quilt Competition 2014, their Opal 670 Sewing Machine! So I changed the colours to add oranges and yellows…what a happy coincidence that these happen to be the bride’s favourite colours! I would quilt footprints around the sacred fire, symbolic of the ‘saptapadi’ – the seven steps taken by the couple, before they make the beautiful wedding vows, which have come down from the ancient Vedas. “We have taken the Seven Steps. You have become mine forever. Yes, we have become partners. I have become yours. Hereafter, I cannot live without you. Do not live without me. Let us share the joys. We are word and meaning, united. You are thought and I am sound. May the night be honey-sweet for us. May the morning be honey-sweet for us. May the earth be honey-sweet for us. May the heavens be honey-sweet for us. May the plants be honey-sweet for us. May the sun be all honey for us. 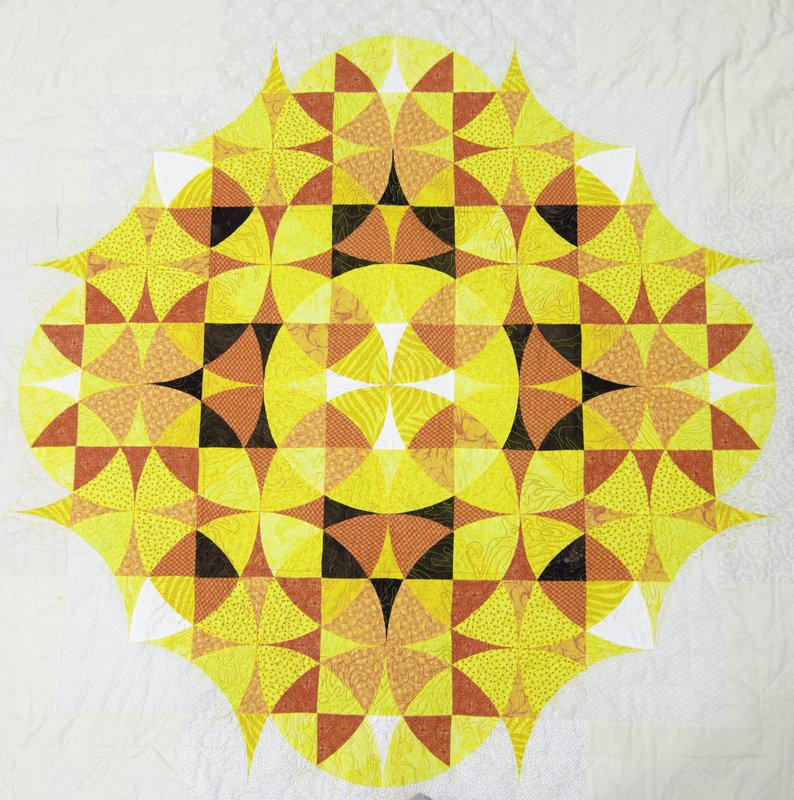 The original quilt was planned as 9×9 blocks of 10″ each. Around that time, the last date of this challenge was extended to 31st March, and I decided to participate. That meant a change in the size of the pattern and the layout. As I was working with fat quarters from my stash, the block size was changed to 8.5″ to make best use of the fabric. 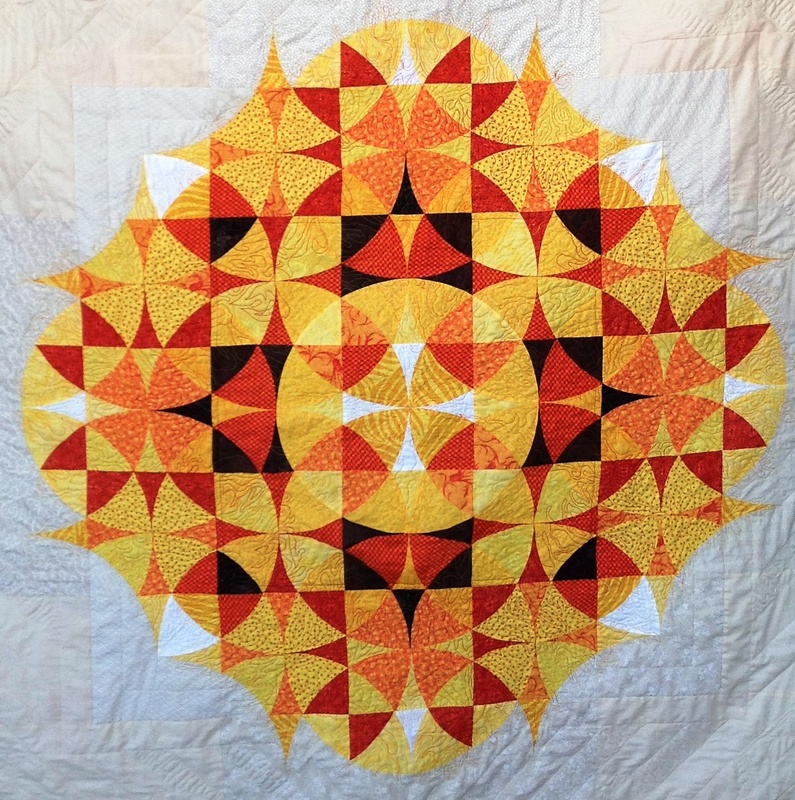 One question I have been asked is why I did not use a black or charcoal grey for the background – it wuld have given a decidedly modern twist to my quilt. The answer is simple – those colours are inauspicious, and no Hindu would have them associated with a wedding ceremony which is a sacred ritual ( rather than a contractual arrangement). And then, I broke the bobbin winder on my sewing machine! My mother in law’s trusty old hand cranked sewing machine ( part of her dowry, circa 1936) emerged to do my piecing. 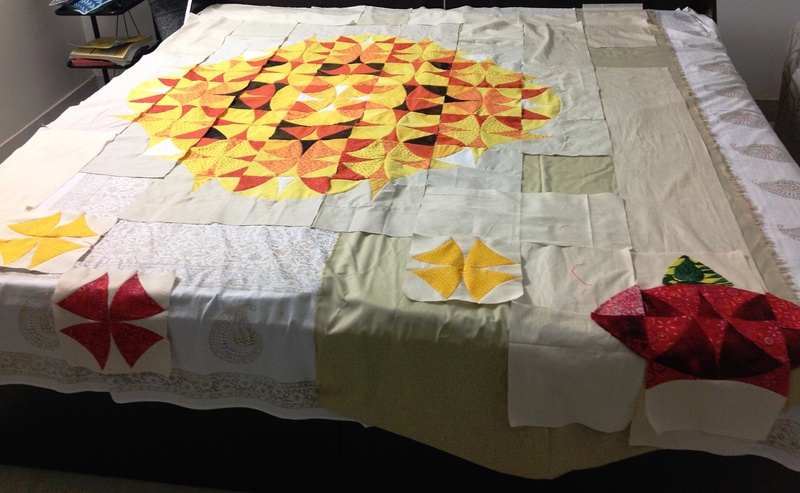 Once the piecing was done, various layouts were tried out. The brown corners of the 3×3 centre represent the innermost well of the three stepped ‘agnikund’, the wrought iron ‘fire vessel’. The other brown pieces were the wood used in the fire. I planned to quilt mango leaves ( a symbol of Mahalaxmi, the Goddess of wealth and prosperity) strung on a thread in the top row! Trying out the lay out options! At this stage, my consultant ( who else, but Dear Spouse) vetoed all additions in the form of ‘ kalash’ and flowers or even quilted leaves. Too cliched, he announced! 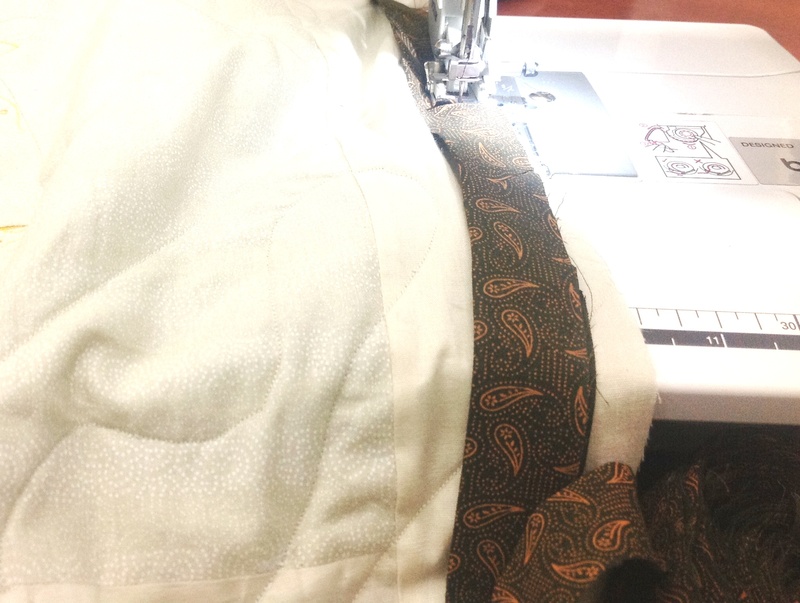 The blocks came together on my sewing machine and much to my chagrin, I started discovering that my perfect 1/4″ seams were not so perfect after all. 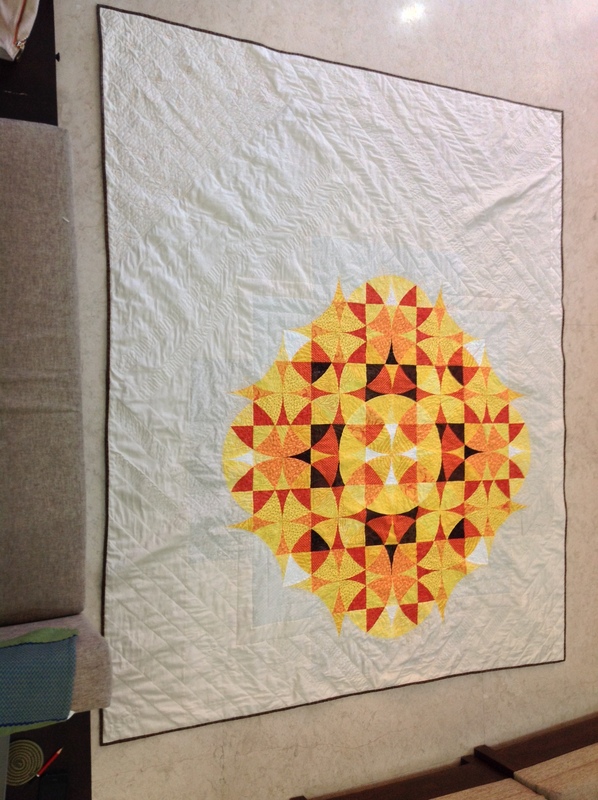 Here is the back of the pieced ‘fire’. And so the top was readied, before I pieced the back. I decided to put the leftover fabric to use as a border around my giant winding ways 25.5″ block. This block would be centred exactly at the centre of the fire block on the front! Then came the basting. 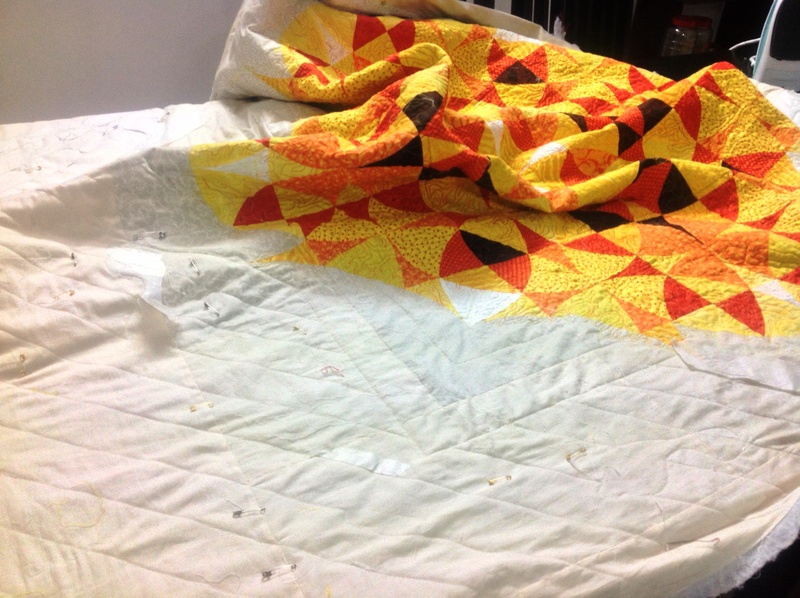 I thread basted the quilt ( never again! 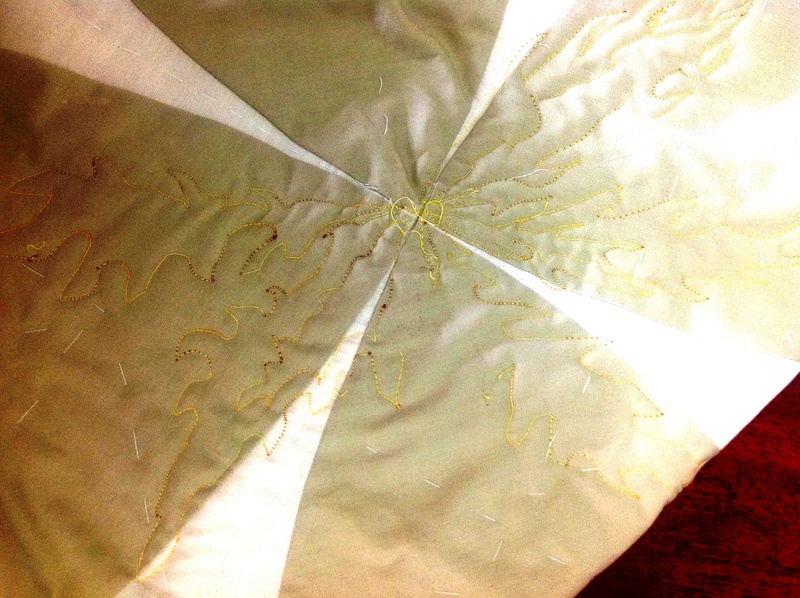 The threads keep getting entangled in the quilting). Till I was ready to give it all up in despair. Tension problems, eyelashes and more! I have probably buried upwards of 1500 threads into this quilt! 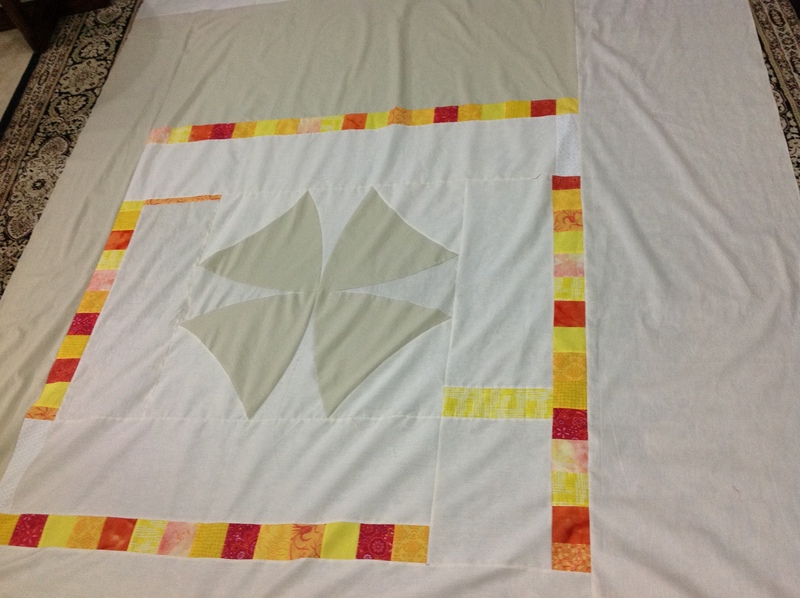 I am so proud that I did not clip a singe thread and I matched each quilting start off point and break off point perfectly, so that except in about half a dozen places, you cannot tell where disaster had struck! I decided to go back to my trusted walking foot for the background diagonals. Once this was done, I relaxed. I would submit it in an `as is, where is’ condition on last date of submission! Now I free motion quilted flowers to draw attention to the saptapadi – the seven pairs of footprints around the ‘fire’. I also free motion quilted stringed flowers within the diagonals, representing the garlands that decorate the wedding ‘mandap’ (canopy) under which the ceremony takes place! By now, I was fmqing with ease, and I could use the variegated thread, breaking it only once over an area of nearly 36″ X 36″! And here is the front! I am quite happy with the way it has shaped up! ( Though, don’t tell anyone, but I am mulling over adding some more quilting – perhaps closer diagonal lines – to add more texture to the background!) Meanwhile, the newly married couple wait for their wedding gift. Here are some more pics of my prize winning quilt!! 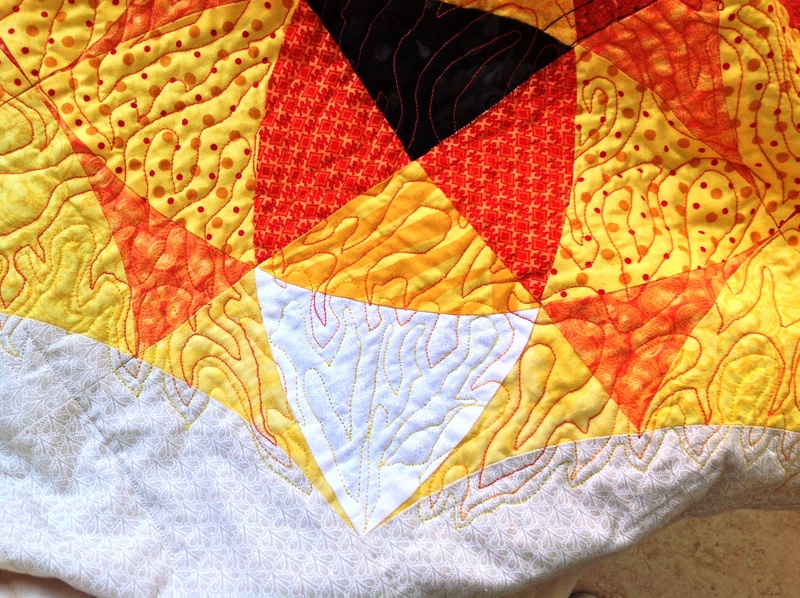 Author MadsPosted on May 1, 2014 October 8, 2014 Categories My Quilts, Patchwork of my lifeTags fire quilt, fmq flames, fmq footprints, Hindu wedding quilt, Quilt, Saptapadi quilt, winding ways quilt11 Comments on And the second prize goes to…Yayyyy! It’s me!